I watched Lady and the Tramp again just last week, after more years than I’d like to count. It was a family occasion, and the film enthralled viewers whose ages ranged widely. The littlest ones (5 1/2 and 3) were a trifle unnerved at times: Disney animated features are not without their dark shadows, in this case involving a muzzle, a dog-catcher, and an ominous trip to the pound. But that’s as it should be. Even little kids respond to suspense and the threat of jeopardy. And in any Disneyesque tale, the darkness makes the sunshine seem all the brighter. 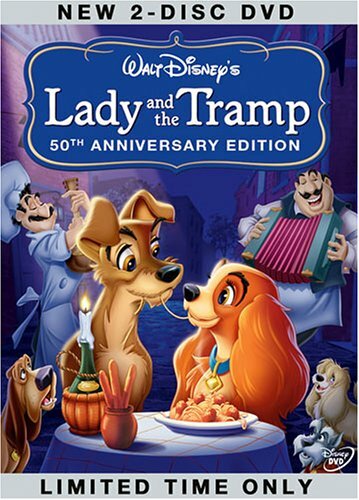 Lady and the Tramp was originally released back in 1955, in an era that gloried in hand-drawn animation. So it’s no surprise that the film is lovely to look at. (To my mind, old fogey that I am, the beauty of the hand-drawn line is still superior to the admittedly hipper style of today’s computer-animated features.) Making this valentine to the canine world all the sweeter, the storytellers set Lady and the Tramp back in time, in some vaguely post-Victorian era when people lit gas lamps, rode in horse-drawn vehicles, and dwelt in wonderful houses both quaint and noble. And Christmas always seems just around the corner. Though the supposed date of the story is 1909, its ideology very much reflects the 1950s, the era of Disneyland’s opening, and a decade when Disney values reigned supreme. (The commercial strip shown in the film is not so different from Disneyland’s famous Main Street U.S.A., a place reflecting Walt’s own dream of the wholesome midwestern childhood he’d like to have led.) The Fifties were a time that exalted domesticity, and Lady and the Tramp certainly does its share of promoting home and family. The central human couple, Jim Dear and Darling, are paragons of domestic bliss, as their names imply. But of course the central point of view in Lady and the Tramp belongs to the canine set. Of course all this happiness can’t last, thanks to a visit from Aunt Sarah and her wonderfully evil Siamese cats. Lady flees, cruelly muzzled, only to be rescued by Tramp, who takes her on a romantic dinner-date (yes, the spaghetti scene). For a while the vagabond life seems fun, but serious danger lurks. After a flurry of excitement highlighted by the threat of danger to the baby, Tramp proves his mettle and is accepted as a full-fledged member of Lady’s household. They marry, presumably, and produce several adorable pups. And Tramp now proudly wears a collar of his own. This movie was released in the same year as Rebel Without a Cause, But in a Disney movie, monogamy and home sweet home are things to be cherished. Here’s my husband’s succinct review of Darren Aronofsky’s new film, Mother! : “This is the worst movie I’ve ever seen.” Bernie knew he was buying tickets for a horror flick. But his reaction to its grim tone and outrageously grotesque ending was so strong that, on the morning after we checked it out at our favorite multiplex, I heard him warning others away. He simply couldn’t believe this was the same movie about which critics were raving. And what did I personally think? I’m not squeamish when it comes to movie mayhem, but suffice it to say that sitting through Mother! was not what you’d call fun. In fact, I’d classify it as an ordeal, especially for someone who takes pride in his or her surroundings. (This is definitely a story in which, to borrow Jean-Paul Sartre’s phrase, hell is other people.) Still, I’m not at all sorry we made that trip to the movies. I loved the fact that, once the closing credits ended I went out into the lobby and saw small clutches of moviegoers earnestly discussing what they’d just seen. At too many screenings these days, the audience simply shrugs off whatever it has experienced and goes on to the next amusement that beckons. Mother!, by contrast, makes an impact. 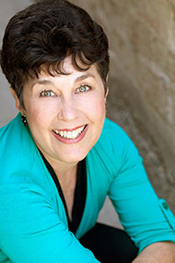 As for that grotesque ending, it bothered me much less than it did my literal-minded husband. I apologize for stereotyping, but he’s an engineer, which may be why he’s a pragmatic guy, one who takes things at face value. I, on the other hand, am a perennial English major, always in search of elusive meaning. And that’s why, midway through the film, I developed a hunch that what seemed like a deeply psychological story about an unraveling marriage and an unraveling mind was in fact meant to be read symbolically. The clues were there: this story had evolved into something in which conventional realism was beside the point. Mother!, I surmised, was less a case study than a good old-fashioned allegory. The movie critics who’ve been weighing in don’t all parse the allegory the same way. I’ve spotted interpretations that are distinctly theological, as well as others that focus on environmental concerns. Given the elasticity of Aronofsky’s story, both views are plausible, and the director’s own statements seem to imply that these interpretations are on the right track. But I confess that my first thoughts about the meaning of the central couple’s relationship were a bit more human and personal. I initially read Mother! as a parable of fame, in which the spouse with a clamorous public following forgets about the value of his private life. His wife may be his goddess and his muse, but it’s still all too easy to forget about her needs. And, of course, the needs of those she spawns. But I’ve probably already said too much. Since the death of Jerry Lewis on August 20, I’ve been debating about what to say in his memory. I can’t pretend I was a number-one fan, and like most of Hollywood I don’t share in the passion of French critics and audiences for this hard-working multihyphenate (comedian-actor-writer-director-producer-philanthropist). In the name of research, I went back to two of his best-known films. 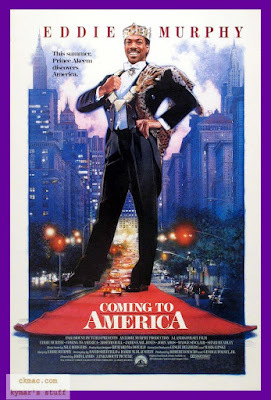 The King of Comedy, from 1982, is an unusual Martin Scorsese film both because nobody gets violently blown away and because the leading man is, of all things, a would-be comedian. He’s played by Scorsese favorite Robert De Niro, in the pathetic role of a nebbish who’s convinced he has the comic chops to score as a Johnny Carson-type TV comic. He’s so desperate to ingratiate himself with the reigning king of late night, Jerry Langford, that he resorts to kidnapping (not exactly an ideal career move). The role of Langford, I’m told, was originally offered to Carson himself, and other comic actors were also considered before the part fell into the hands of Jerry Lewis. He plays Langford as a powerful but exasperated figure, all too weary of the hangers-on (like De Niro’s Rupert Pupkin) who complicate his personal life. There’s a memorable moment that’s apparently taken from Lewis’s actual experience: when he rebuffs an old lady who demands an autograph during a high-pressure moment, she screams after him, “"You should only get cancer,"
Lewis plays his role convincingly, but I don’t understand the hoopla surrounding it. Some of his devoted fans insist that in The King of Comedy he really reveals serious acting chops. Lewis never grasped their enthusiasm, maintaining that he was pretty much playing himself. And so it seems. Lewis’s reputation in Hollywood was that of a tough taskmaster, though one who could also be hugely generous to his inner circle. Remarkably, I was once told by Scott Wilson, who made his mark as one of the killers in In Cold Blood, that early in his career he was offered the chance to be Lewis’s regular stand-in. Wanting to succeed as an actor, he turned the gig down, though he knew this was a great opportunity: Lewis’s stand-ins were well-treated, and often graduated into producer positions. 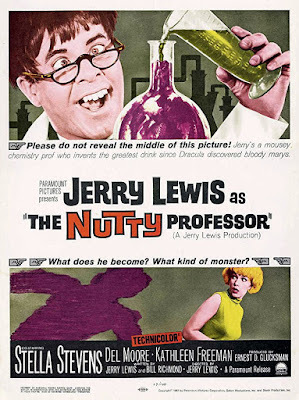 Continuing my exploration of Lewis’s career, I watched what is considered his very best comic role, The Nutty Professor. In this 1963 triumph, a brainy but nerdy scientist concocts a potion that turns him into a handsome lounge lizard named Buddy Love. 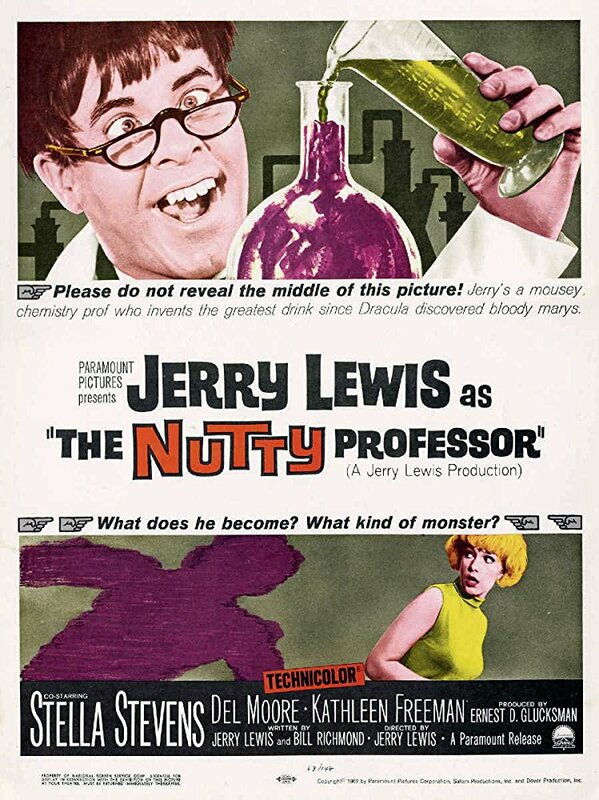 It’s all pretty silly, but Lewis—influenced by his youthful admiration for Spencer Tracy’s transformation scene in the 1941 version of Dr. Jekyll and Mr. Hyde—has a nifty moment when suave Buddy Love evolves on-camera into the clumsy but lovable Dr. Julius Kelp. It’s remarkable how seamlessly he evolves from the cocky and surprisingly handsome Buddy to the tongue-tied, hunched-over Kelp (who, amazingly enough, manages to win the love of a voluptuous but sweet co-ed played by Stella Stevens). What I remember best about Jerry Lewis is how much my family loved him when he appeared on early television. He was at his funniest when his goofy antics played off against the suave presence of Dean Martin. They made some great movies as a duo, but I went in search of a catchphrase I’d almost forgot: “Donnnn’t lick it.” Thanks to YouTube, I ultimately found a sample of the early Jerry Lewis who had my parents and me in stitches. You don’t have to be French to be tickled by this skit from the Colgate Comedy Hour, circa 1951. It’s live TV at its looniest. Deborah is married to John Landis, who directed Coming to America in 1988. Landis had first directed an eager young Eddie Murphy in Trading Places; five years later, with Murphy having leapt into the Hollywood pantheon in Beverly Hills Cop, the relationship between director and star was apparently quite fraught. Some of the tension surrounded the fact that Murphy had dreamed up the film’s story (though a famous legal case involved humorist Art Buchwald’s claim that the origin of the plot came from him). Naturally, Prince Akeem prefers a girl who loves him for himself. Which is why he and buddy Semmi (Arsenio Hall) travel to New York City to experience real life. Murphy is quite hilarious in his enthusiastic embrace of life in a Queens tenement. Next thing you know, he’s cheerfully mopping floors at McDowell’s, an obvious McDonald’s rip-off run by a very funny John Amos. Some of the movie’s best satiric moments are saved for a party at the home of the nouveau-riche Amos, who decorates his walls with copies of famous paintings (like a version of Manet’s “A Bar at the Folies-Bergère” in which the pretty barmaid has dark African skin). There’s also some fun at the expense of an entrepreneur character who got rich off a greasy Jheri-curl-like hair oil. I found the eager naïveté of Murphy’s character totally endearing, and he plays off well against Arsenio Hall’s more worldly buddy, who installs neon décor and a hot tub in their spartan cold-water flat, just as Prince Akeem is trying to impress his American girlfriend with his poverty. Murphy and Hall are clearly total hams: they also take on a clutch of other characters including a James Brown-like soul preacher and some codgers hanging around an old-school barber shop. Murphy even gets to impersonate an elderly Jewish man who ends the film with a moldy Yiddish dialect joke. I was totally fooled until the credits. No wonder Rick Baker earned an Oscar nomination for his wizardry with makeup. Universal Pictures, founded in 1912, today is America’s oldest movie studio. Long ago Universal was best known for its monster films, notably Frankenstein, Dracula, and The Mummy. Universal’s affection for horror has continued through the years: visitors to the studio backlot are shown sets and memorabilia connected with such super-scary movies as Psycho, Jaws, and Jurassic Park. There’s nothing Universal loves more than a good scare. But of course it was those studio tours that really put Universal on the map as a major SoCal attraction. They began all the way back in 1915, cost a nickel, and included a boxed chicken lunch. (Today’s prices are a whole lot higher. It costs $25 simply to park your car.) In 1964, under corporate ownership, Universal began to seriously turn itself into a theme park. It started with a narrated bus ride highlighted by glimpses of stars’ bungalows and by such “surprises” as a disintegrating bridge and a flash flood that showed off what Hollywood could do by way of movie magic. Gradually, there arose Disneylandish “lands” dedicated to the Universal hits of the moment. There’ve been some strange bedfellows in this process. For years one of the park’s most popular rides allowed visitors to vicariously experience a bonafide Universal blockbuster, Back to the Future. Eventually, though, that magic DeLorean was sent to the junkyard. As I discovered on a recent visit to Universal Studios Hollywood, this ride’s place has now been taken by an elaborate homage to The Simpsons, the long-running cartoon show that hails not from Universal but from Fox Studios. Instead of hurtling into space in miniature DeLoreans, visitors in a Simpson-esque jalopy now try to escape Sideshow Bob’s attempts to derail the Krustyland Theme Park. It’s scary and goofy at the same time. Like most of today’s theme-park “dark rides,” this Simpsons adventure combines physical jolts with the dramatic use of film that draws visitors into the action. In other of the park’s attractions, like the one featuring those madcap Minions, 3-D glasses enhance the effect. As your seat bounces and soars, you can be forgiven for feeling a bit queasy. But it’s doubtless both cheaper and safer to explore the possibilities of the film medium than to build an old-fashioned outdoor roller coaster. And the results, while doubtless less heart-stopping for the rider, are a great deal more imaginative. The pride of today’s Universal Studios is The Wizarding World of Harry Potter. Here once again is an elaborate “land” dedicated to a movie project made by another studio (Warner Bros.). 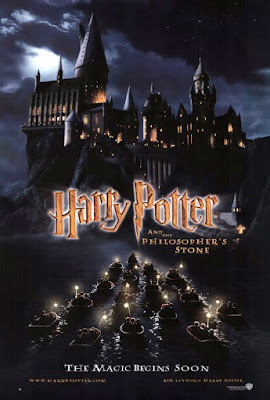 Nonetheless, the Universal braintrust has lavished much love and care on reproducing all the familiar Potter tropes. There’s the charming town of Hogsmead, covered with snow (quite a contrast to the California summer). You can sample butter beer, have a magic wand choose you at Ollivanders, and bop to the music of a frog chorale. Above it all looms the enormous bulk of Hogwarts. Enter, and you’ll find yourself playing follow-the-leader with Harry himself as, on his broomstick, he eludes a giant dragon and plunges down toward a raging chasm. (My stomach has still not quite recovered.) In this ride above all, the possibilities of cinema as a visceral experience are fully sampled. I was cheered by the fact that there’s live action too: clever on-site performers (like that wand-making expert), as well as cheerful employees who deftly enhance the fun. No wonder so many guests purchase interactive wands and academic robes. Much as I love movies, I adore encounters with human beings who know how to welcome me into a fantasy world. As a man and a president, Richard Nixon was inspired by movies, particularly Patton, which he watched over and over in times of stress. But at many key points his career was driven by the new medium of television. Farrell details how, in 1952, at the point when his place on the Eisenhower ticket was threatened by allegations of financial misconduct, Nixon turned to TV to make his case to the American people. Though the optics were crude and were improvised on the spot, it worked. He became Ike’s two-term running mate. Television was less a friend to him, of course, in 1960, when—as the Republican candidate for president—he entered into a series of nationally televised debates with Senator John F. Kennedy. Farrell notes that since Nixon’s entry into national politics in 1950, “the percentage of American households with television sets had leaped from 11 to 88 percent. . . .The audience for the first debate was some 70 to 80 million people, in a country with 107 million adults.” In that first head-to-head, Kennedy proved handsome, articulate, confident. Nixon, done in by fatigue, a bad makeup job, and the public perception that he was ill at ease, could not hope to match the challenger’s poise. So Nixon became a president of an evolving media age. Of course, the television cameras were there as the Watergate scandal continued to electrify the public. When Nixon stepped down from the presidency on August 9, 1974, they captured his final words and his final “V for victory” salute. Three years later, beginning on March 23, 1977, they recorded his unprecedented series of interviews with British journalist David Frost. 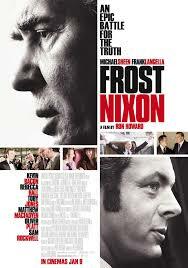 The results were so riveting that they evolved into Frost/Nixon, a 2006 British play that took Broadway by storm. In 2008, Ron Howard directed original stars Frank Langella and Michael Sheen in the Oscar-nominated movie. When SoCal was sweltering in the grip of the summer’s third heatwave, I decided to take myself to the movies. A perfect choice was a film set in early spring in the frozen wilds of Wyoming. 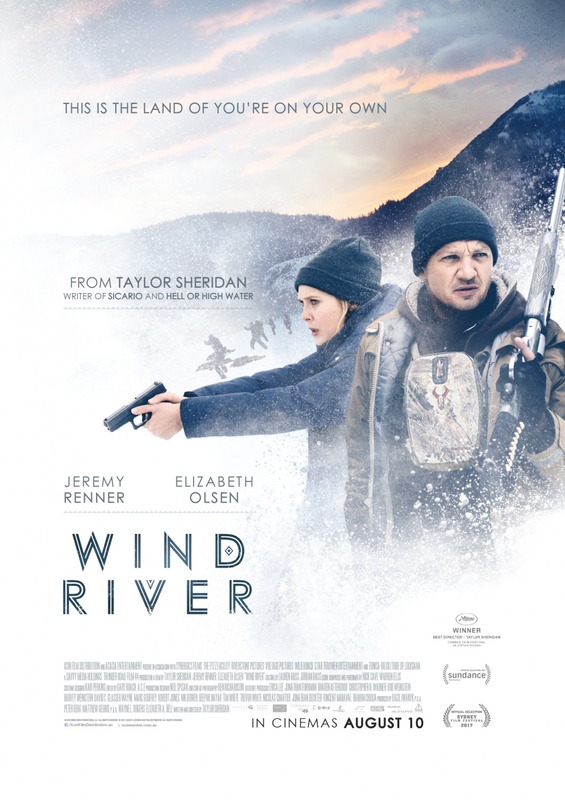 True, Wind River was filmed mostly in Utah. But its sense of place is so powerful that for the length of the movie I felt a genuine chill. It’s an apt quote, because this is a film about loss. Which means it’s tremendously sad, but also exhilarating, because the characters who people Wind River are so human: angry, funny, stoic, despairing, and determined to live out their lives on the best terms they can get. They include Jeremy Renner in another of his masterful from-the-gut performances as a hunter with the Fish and Wildlife Service, Elizabeth Olsen as an unlikely FBI agent, and a clutch of remarkable Native American actors, including Graham Greene, once nominated for an Oscar for his supporting role in Dances with Wolves. Dances with Wolves, which nabbed seven Oscars (out of 12 nominations) back in 1991, makes an interesting contrast to Wind River. When the Kevin Costner vehicle made its debut, it was hailed for its picturesque and highly sympathetic portrayal of Native American life. Unlike classic westerns in the John Wayne mold (see Stagecoach or The Searchers), it did not show Indians as heartless marauders, but rather as a sophisticated culture with a rich heritage. Of course, that was a period piece, as well as something of a romance, with the Indian characters coming off as noble savages. The Native Americans in Wind River have ordinary American names (Ben, Natalie, Martin) and wear ordinary American clothes. Old tribal rituals seem to have little appeal for them. Some of these characters have aspirations to do more with their lives than just hang on. But most seem stuck in a place that discourages dreams. There’s hopelessness and drug abuse. And young Native American women blessed with beauty and spirit are all too vulnerable to threats from both within and without. The film ends with a shocking revelation: the FBI keeps no statistics on missing Indian women, whose numbers remain unknown.